I have quite a few palms I’ve transplanted the last couple years. And, most of them are doing great, and I expect they’ll look even better the second year as the roots have grown enough to support them. I usually add Fertilome Root Stimulator (4-10-3) directly after transplanting and fertilize them every three months with Scott’s Palm and Ornamental slow release fertilizer (8-4-8)every 3-4 months. In the spring- usually the end of February, because spring arrives early here is southeast Georgia- I’ll add Vigrio (sp) fast release pelletized fertilizer and I also add it in the middle of the summer. Last year I saw a FB ad selling two windmill palms for $20 each. I couldn’t resist, so I loaded my trailer up, dug them up and planted them in a part-shade/part sun area in the yard. Down here, full sun doesn’t do these guys any favors. After transplanting them in April, the older leaves started to yellow. I figured that the new growth would be greener, and it was. Now it seems all the leaves are on the yellow side. I thought this might be because of the cooler weather. However, they are also planted in an area that receives a lot of water, a lot more than any of my other palms. It does drain off, but I’m wondering if the nutrients are leaching; the soil is loamy on the sandy side. What are some fast acting, immediate release fertilizers you guys have experience with? I’ll try to get some more pictures tomorrow in the daylight. Now it seems all the leaves are on the yellow side. I thought this might be because of the cooler weather. However, they are also planted in an area that receives a lot of water, a lot more than any of my other palms. It does drain off, but I’m wondering if the nutrients are leaching; the soil is loamy on the sandy side. Correct on both accounts. They have a harder time taking up nutrients in the winter and all the added rain does leach away the nutrients. I see this with my palms. Once it warms up and you hit them with fertilizer they'll start looking much better. Plus I find the ones I have that have been in the ground 3 years or more don't yellow quite to that effect. I have three new ones I planted in September and they look terrible right now, so I expect this year will be a lot of regrowth and by spring 2020 they should be looking really good. I use JR Peters 51624 Jack's Classic 16-5-25 Palm Food for fast green up (mix in gallon of water and use). I mainly use palmgain for main fertilizer. 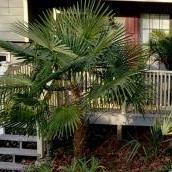 Over winter older fronds will die back as the palm adjusts to lower light levels whether in GA or FL. It will take at least 1 year for a transplanted windmill to establish roots/start to do good. This year it will do better. I use palmgain as well, but also hit my windmills with miracle gro. I use seaweed extract for a couple months following transplant and as a foliar spray a couple times per year. As well I use aquarium water when I do maintenance on my fish tanks, as it is warm, dechlorinated and has a mild fertilizing effect. That Jack's Classic Palm Food is the palm version of miracle grow. I don't use it much. I do sea kelp and fish fertilizer. Very mild and lower NPK means I can feed 1-4 times a month with no issue and the root growth is quite amazing in my potted specimens. I sometimes do a foliar application of just sea kelp, but Im not sure its worth it when I'm spoon feeding throughout the month. Foliar works GREAT for my grass and allowed me to keep my Bermuda grass mostly green through mid January. 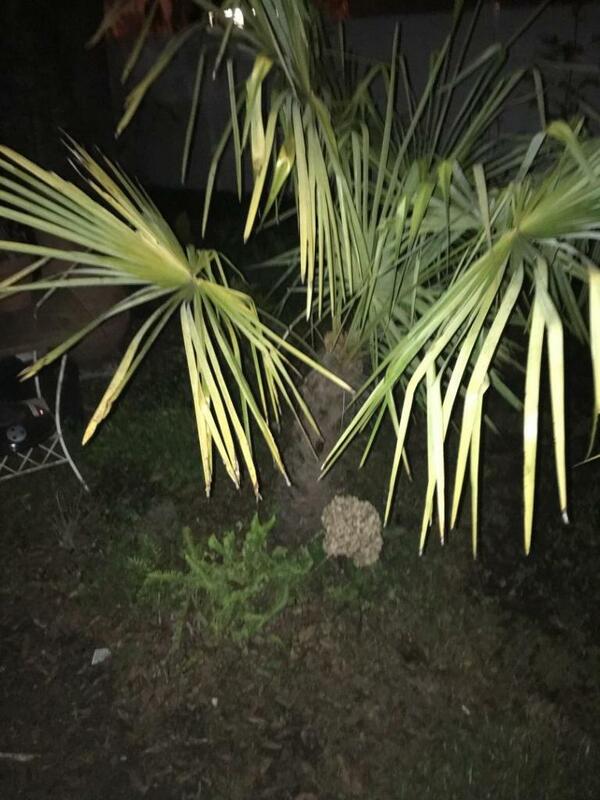 When I established my Trachycarpus palm I just made sure it was well watered, and it never really seemed to stop growing from the day I planted it. I also checked to make sure it had some healthy roots in the pot before I bought it. I've found out root health is really important when trying to establish many palms. I didnt apply a fertilizer for the first season to the plant, then the following year I did apply palmgain to it 2 or 3 times over the spring and summer. I was looking at one of my queen palms today and it looks like the newest leaves are coming out in a slightly smaller and more chlorotic form. My Queens have never had a nutrient deficiency or frizzletop since they were planted in 1994 (very lucky for a South Floridian). The leaves do not seem to show signs of a frizzletop like Mn deficiency... any thoughts? If it is a nutrient deficiency, is there a way to increase soil pH or permanently resolve an issue like that without using chemical fertilizers or making the palms dependent on external help to grow properly? Windmill, should I be concerned? Should I be concerned with this area of my windmill or is this considered normal? What is the difference between trachycarpus fortunei x wagnerianus and trachycarpus wagnerianus x fortunei? 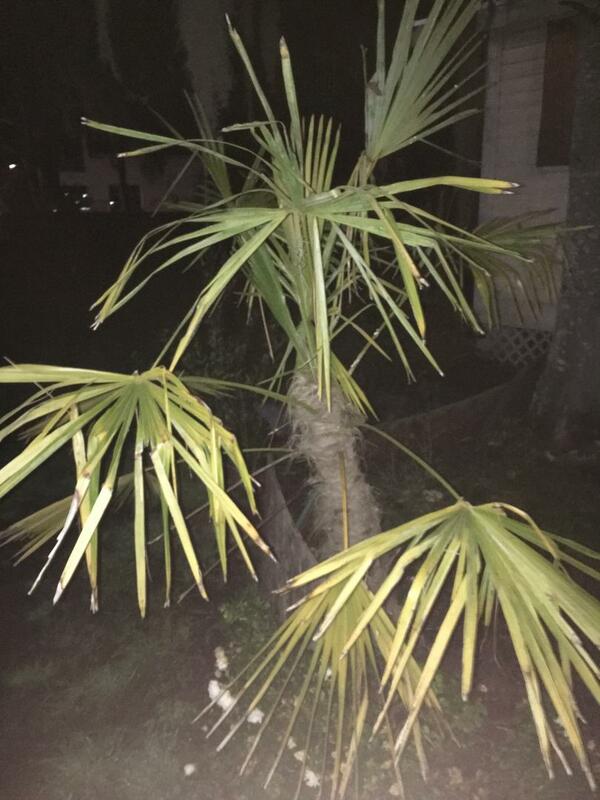 Hi my name is Kevin and I am the owner of Island Wide Palm Trees, we are located on Long Island in New York. We sell palm trees as far south as Virginia and as far north as Massachusetts. 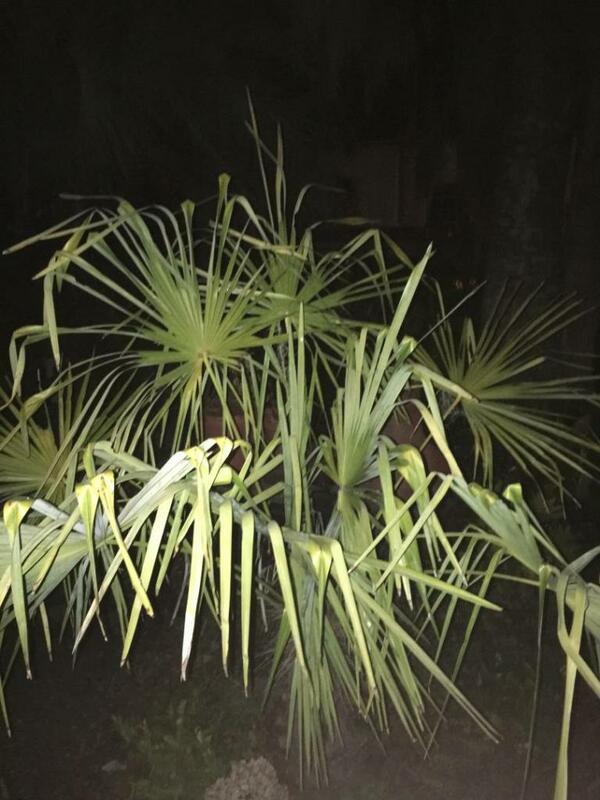 Here is pictures of one of my customer's Windmill Palms that have survived the past 4 winters. This spring will be 5 winters. You can not ask for better then this. The best way to keep the trees alive is to have a good wrapping system. We have an amazing wrapping system that you can see on our website. If you have any questions about how to keep these windmills alive feel free to contact me. I will be more than happy to try and help you.